‘Twas a rainy October day, and the empty oven in the dorm kitchenette begged to be filled with something other than Pillsbury slice-and-bake cookies. I had eyes for pie, and it was just a question of what kind to try. 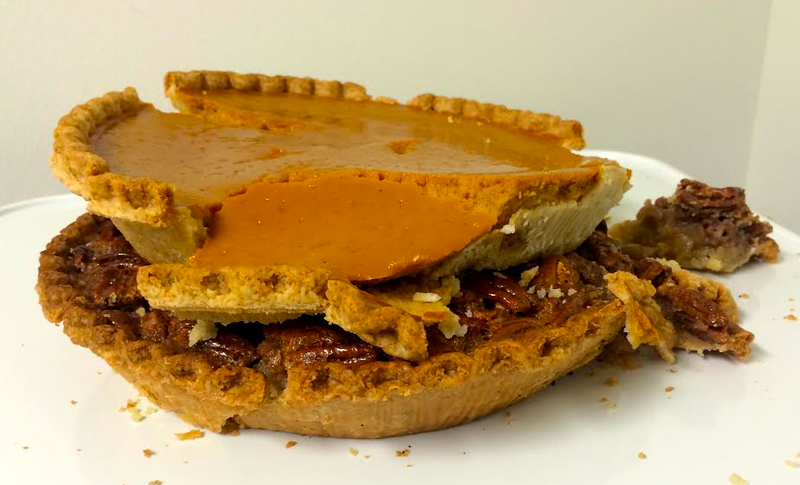 That’s when it hit me: a single variety seems so limiting, and why would I waste a single inch of the limited counter space in the tiny kitchen when I could place one pie right on top of the other and cut into them like a cake? That’s two types of pie in one gooey, delicious slice of a stacked pie. I was ready to contact Shark Tank about making my revolutionary idea a multi-million dollar company that would impact pie-eaters everywhere when I learned that I’m actually not that clever, and pie stacking already exists. After some extensive investigation into the criminal bakers who stole my idea before I was ready to share it (I’m not even mad about it. It’s fine. ), I discovered that the concept of pie stacking originated in the South in the early 1900’s. It was common practice to bring pies to church functions, but after loading ma, pa, and all the kids into the buggy, there would be no room for the pies. Hence, they would stack the pies in order to make more room in the carriage. These pies were generally filled with some variation of sugary, buttery goodness, and became popularly known as the Kentucky Stack Pie. But on this October day, I felt like making something autumnal. So I set off to construct a pumpkin/pecan/chocolate stack pie. I was eager to jump into the recipe until I realized something that would end up being the Achilles heel of my pie stacking fantasy: I was KitchenAid-less. This left me with no option but to buy – dare I say it – grocery store crust. After a time-out to silently beg Martha Stewart’s forgiveness and tame my shame, I made the fillings 100% from scratch. 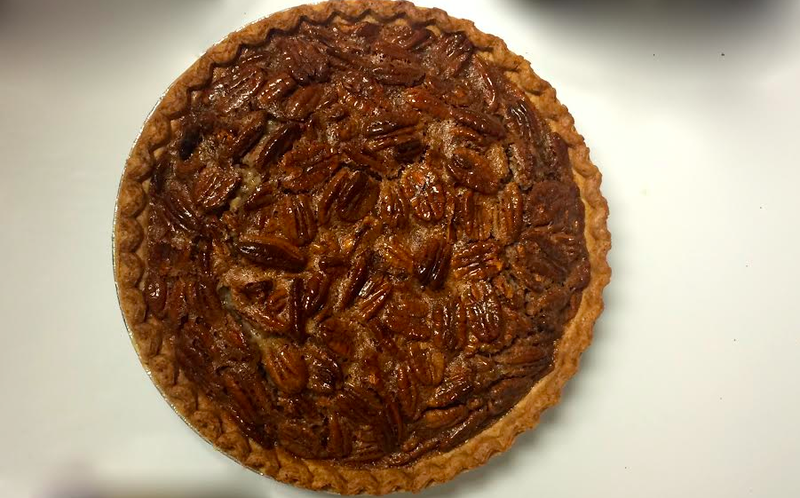 The pecan pie was a vision of fall, packed with candied nuts and corn-syrupy goodness. 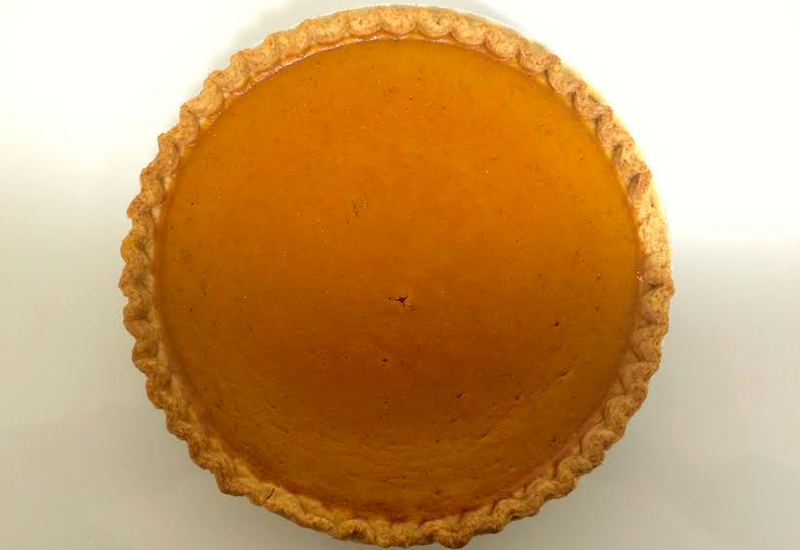 The pumpkin pie was velvety, light, and had the perfect amount of spice. The chocolate “pie” came out like a sad, flat brownie, and I didn’t end up using it because it honestly looked offensive to the eyes alongside the perfect pecan and pumpkin pies. I don’t want to talk about it. The lessons of my pie-stacking saga are these: store-bought pie shells are the devil, dorm kitchens are good test kitchens, and stacking pies is messy. But it was one delicious mess.